This little lady is 7 months old! She's slowly gaining weight and at her last weigh-in a week ago weighed 10 lbs. 13 oz. She's 1 foot 10 inches long and is still wearing 0-3 month clothing. Her head and her height are quickly catching up to where they should be, but her weight is still lagging a bit. Thankfully she has been eating SO MUCH better since last months post and now averages between 35-40 mls per bottle. We still add microlipids to each bottle to give her some extra calories. 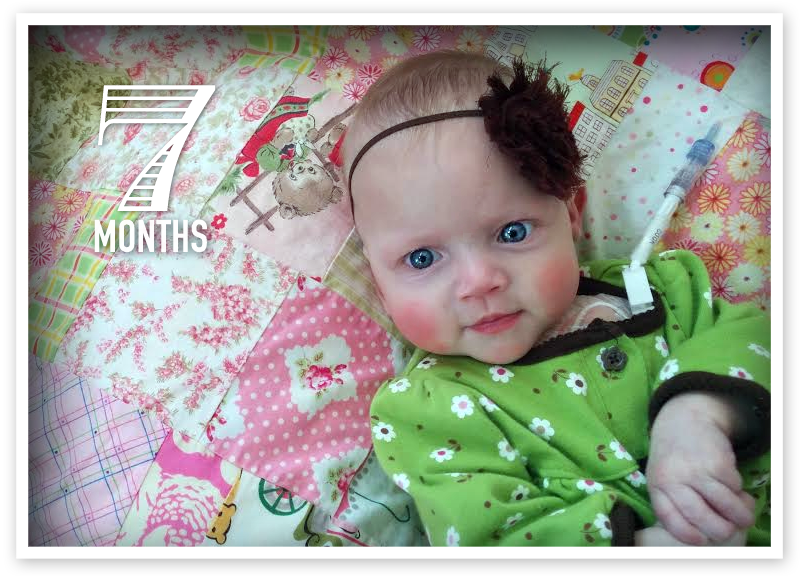 Her TPN has been reduced to 21 hours a day now (yay!). 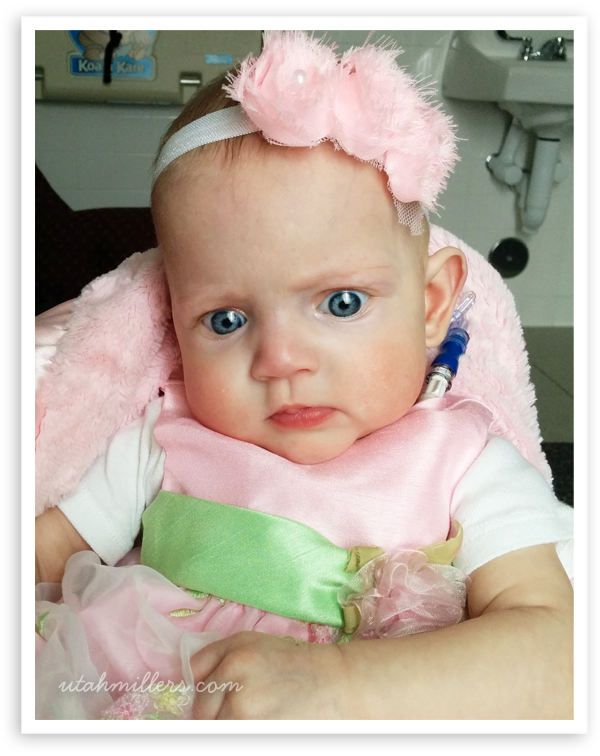 The goal in reducing her TPN is to try to have her feel a little more hungry so that she'll continue to up her feeds by mouth. 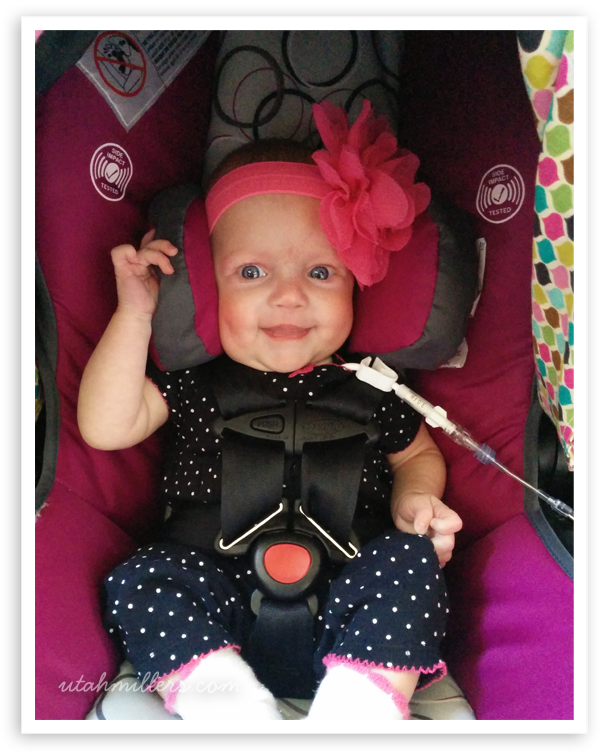 At her nutrition clinic this month her dietitian said she felt Carly was ready to start solids (yay!). We've started her on veggies and meats only as her little gut won't tolerate fruits and carbs well. She's off all meds (yay!) but still takes several supplements (iron, calcium & fish oil) by mouth. She'll always need to be on a variety of nutritional supplements throughout her life since she's missing so much of her small intestine. Overall she is progressing so incredibly well! She's taking her sweet ol' time gaining weight, but slow and steady wins the race! Carly has so many medical supplies that I bought this rolling cart to store everything in. 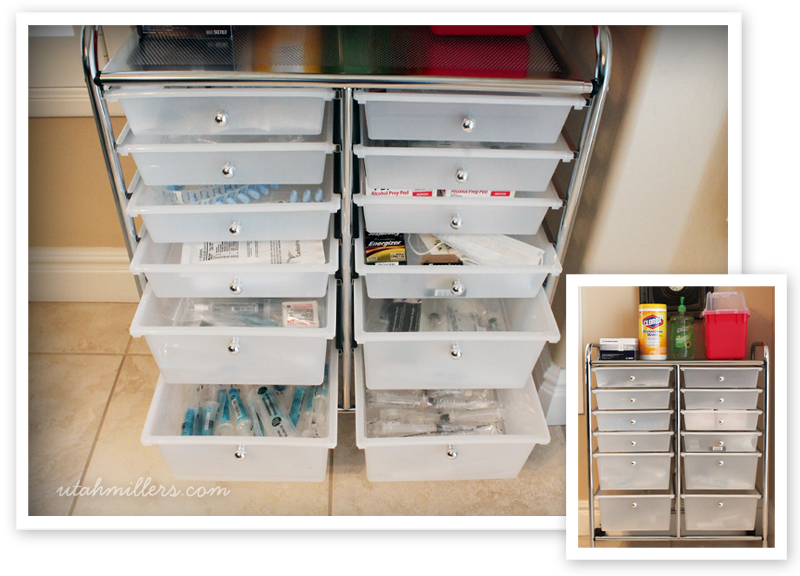 We keep it in a corner in our kitchen and it has really helped us keep things more organized. Mike thought it was hilarious how excited I got when it came. I seriously felt like a kid at Christmas! It has been so great! 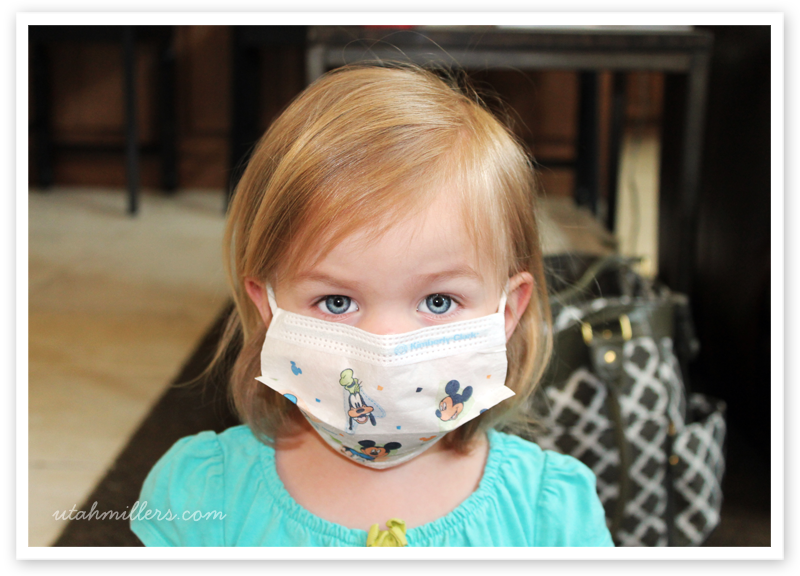 Whenever we are sick we have to mask up around Carly. I do my best to keep Lilly masked up when she has a bug, but it can sure be hard to get her to keep it on! A few weeks ago Lilly somehow broke Carly's line while I was on a phone call, so we had to take another fun little outing to the ER/RTU to get it fixed. Our home care nurse said he has patients that have had 15-20 breaks, so I think we're doing good with only 3 repairs so far. I'm getting to know the staff at the RTU very well...hehe! Cute Carly hanging out with me in the mother's room during sacrament meeting. 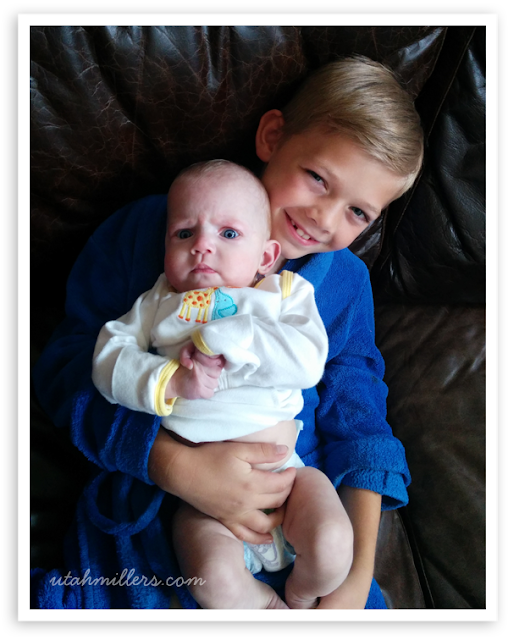 Lilly loves to hold Carly. Bryson, not so much. He's usually too busy playing outside with friends or building something out of Legos, but he did sit and hold her the other day for a second, so I had to snap a picture of the rare moment. Carly's new favorite thing is this bouncer. She's so small that her feet don't touch the ground yet, so we put a pillow underneath so she has a way to bounce. She just LOVES it and bounces around like crazy. 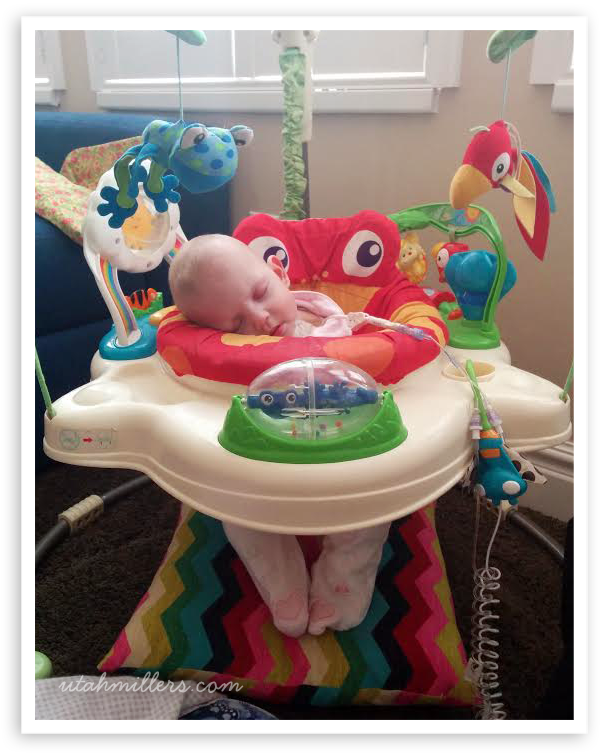 Sometimes she wears herself out bouncing and falls asleep. You'll notice in this picture her new coiled line, which we are loving. She also just got new updated pumps which have been so nice because they prime themselves (yay!). Carly spiked her first fever last Thursday afternoon. Whenever Carly gets a fever of 100.4° or higher we're suppose to take her to the ER because it might be a line infection. I was pretty sure the fever was related to the cold she had, but I called her GI doctor just to be safe and he said to take her to the ER immediately. When we got up to Primary's they drew her blood for cultures and swabbed up her nose so they could determine whether the fever was due to a line infection or just a virus. Cultures take 24-48 hours to grow, so they admitted us to the IMSU overnight so they could start her on antibiotics and keep an eye on her until they got the results back. The nurses there were just absolutely amazed that Carly hadn't had a line infection yet. They said they see short gut kids in there all the time with line infection after line infection, so I was just praying this wasn't going to be Carly's first one. 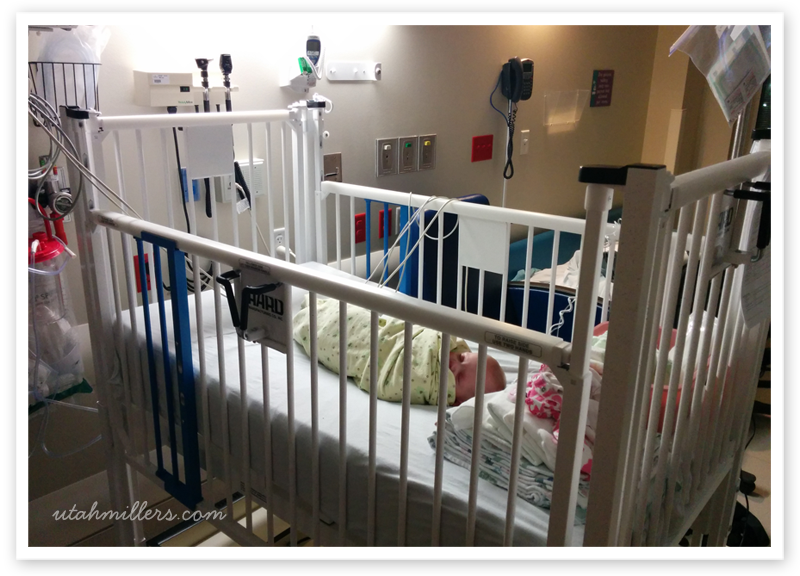 Fortunately, it ended up just being a respiratory virus and so they sent us home. We take so many trips to the ER with Carly that I've realized I need to have an emergency to-go bag packed at all times with stuff we might need if we have to spend the night so I can just grab it and go. I didn't have one packed for this hospital trip, but I'm now all packed and prepared for the next one. 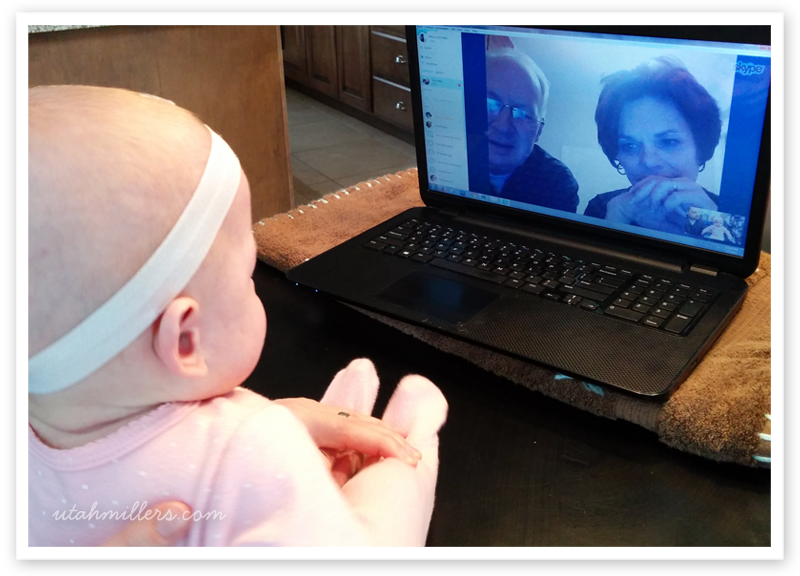 Carly loves Skyping with Unky and Nonni who are serving a mission in Budapest, Hungary. They get home in a few months and are so excited to finally get to meet Carly in person. I just love this little girl to pieces. She has hiccups in her progress every now and again but overall she is progressing so amazingly well! She has completely stolen my heart and I feel so blessed to be her mama. "Children are NOT a distraction from more important work. They are THE MOST important work."